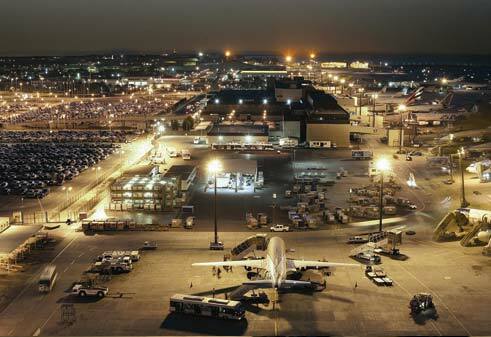 Bahrain International Airport has been expanded in 2010-2011 with 8 additional remote Multiple Apron Ramp System (MARS) gates for large aircraft and one stand-alone gate for smaller aircraft. Each parking position is equipped with various pop-up pits for power, pre-conditioned air, potable water, blue water and sewage. Aqseptence supplied the central plants for the wet services plant room that are connected to 25 pop-up pits for blue water and sewage and to 25 pop-up pits for potable water and pre-conditioned air. A multistage treatment plant was installed to generate potable water out of saline brackish water. The potable water is continuously disinfected using UV and chlorine and distributed by pressure boosting station to the pits in the apron area. The extraction of sewage from the aircraft waste tanks is done by a central vacuum station that is connected through vacuum sewage pipes to the service pits. The collected sewage is discharged through sewage pumps to the receiving manhole of the sewer system. The exhaust air is purified using a 2-stage odour control unit consisting of biofilter and activated carbon filters. The wet services are supplied and extracted without the use of services vehicles through underground pits concept. The retractable pop-up pits are ergonomic and simple to use. When disconnected and retracted the units closes flush with the tarmac. The pit covers are aircraft load rated which allows a roll-over of 90 tons.